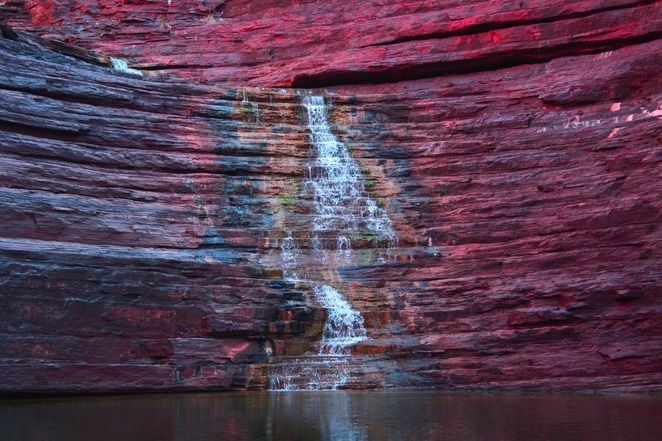 Most West Australians have heard about Karijini National Park, its magnificent gorges and scenery and superlative ridden vistas that lie within it. But how many have actually visited? If you haven't been into this vast Pilbara landscape then make sure you add to your bucket list. Karijini is Western Australia's second largest national park and covers over 6000 square kilometres of land. The only thing that would stop the average weekend traveller from visiting it, is the huge distance from Perth. It's about a 1200 kilometre drive so an extended holiday would be the recommended way to see this place. Karijini is very remote and the nearest place to get supplies and fuel is either at Tom Price or the at the Auski Tourist Village, both are 100 or more kilometres away from Karijini so make sure you have enough fuel to explore the park and get out again. Within the national park, all roads are in good condition even though it is gravel most of the way. Accommodation within the park is very limited with only one campground and a 5 star eco-retreat. Dales Campground is situated near Fortescue Falls. There are sites suitable for caravans and generators are permitted in some areas. The campground provides toilets, water, showers (at the Visitor Centre) and gas barbeques. This campsite is regularly full during the tourist season and especially during school holidays. Bookings are recommended, check on campsite availability by contacting the park. Camping out in this vast wilderness and watching the sunset over the spinifex and hills is well worth the effort. The thing we found the most amazing thing about Karijini is that the majority of its spectacular scenery is within easy reach. It's mostly possible to pull into a car park, walk 100 metres and be looking at gorges plunging down into clear pools and waterfalls at the bottom. Nature lovers will love the flora and fauna that abound in the area. Wildflowers in season are unbelievable and the rock wallabies, dingoes, bush turkeys and a myriad of reptiles will keep you peering around every termite mound and gully hoping for something new to appear. The gorges themselves run through the park and are easily accessed and signposted. The walking tracks vary from the casual stroll up to grade 5 and 6 tracks that are for the more experienced or adventurous hikers. Fortescue Falls, Circular Pool & Fern Pool are three highlights of the Dales Gorge. If you are camping there then this will be the best place to start your adventure. These areas hold permanent waters and on hot days it can be a beautiful place to cool off. From Fortescue Falls turn right to Fern Pool or left for the three hour return walk to Circular Pool. Fern Pool is a must if you don't do the 3 hour walk and is probably the most picturesque place in the park. From the lookout at Joffre Gorge you can look deep into the gorge at the unusual curved walls which forms a natural amphitheatre. The red and blue colourings of the rocks are truly amazing. It's beautiful after rain when a waterfall cascades down its face. You can also clamber down to the bottom of the gorge if you're keen. We also recommend a walk or hike along the bottom of Kalimina Gorge as it allows you the chance to appreciate the amazing rock structures present within the park. Rock pools and a running creek add to the overall experience. Oxer Lookout is possibly the most stunning lookout in Western Australia. From this custom built lookout you can see the junction of 4 mighty gorges - Red, Weano, Joffre and Hancock. You can look down the layered rock and appreciate the tremendous forces which formed this landscape over two billion years ago. We found Weano Gorge as the best introduction to all the walks at Karijini. It has a bit of everything and it's not too difficult. It starts as a relatively easy walk down steps to the basin and a short stroll between the layered rock walls and pools to Handrail Pool, which is great for swimming. Be warned though, the water is very, very cold. For the more experienced, the adventure continues beyond the pool, though particular care needs to be taken and it is recommended you take ample water and snacks with you. At the Red and Knox Gorges whether you're above the gorges looking down from the rim or right at the bottom looking up the lip, it'll provide you dramatic contrasts of colours and textures and will have your camera running hot. Both the gorges have flowing streams of crystal clear water, pebble beds and sand bars. Hancock Gorge is simply stunning but the furthest away of all the gorges. You can explore this area yourself but a "tag along" with a local guide or joining a tour group is recommended for this gorge. Clambering down a steel ladder you hike into a narrowing gorge then into a huge chamber with a collection of small rock pools and textured walls. 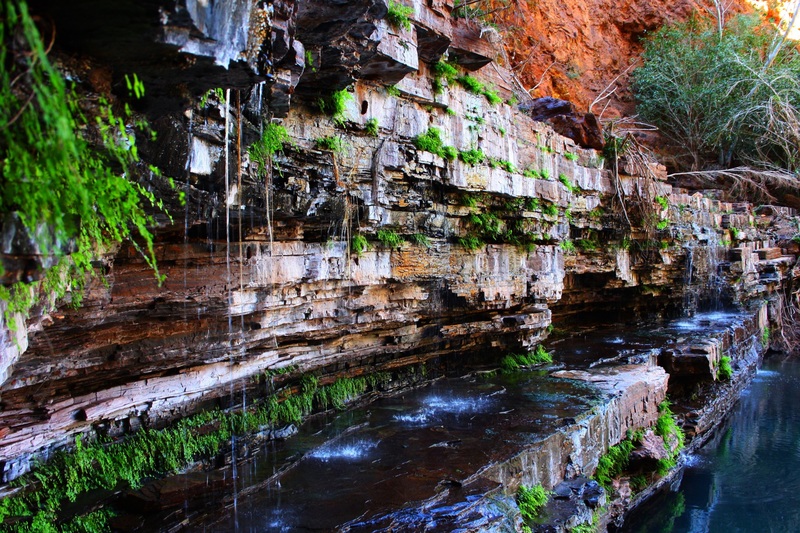 Karijini is a majestic national park, a place of exquisite natural beauty and one place you MUST see. Congrats on your 2nd place. This is a brilliant article and your photos are stunning, Gen. It's now on my WA list of places to visit, thank you. What an amazing place - fabulous photos! What gorgeous photos - so rich in depth and colour. Can't imagine how it must be like to be there physically to see all of that. I thought this was "weekend notes" what to do in PERTH I think the Pilbarra is stretching it a bit! Great pics and all totally useless if your staying in Perth overnight. LOVE these photos!!! Makes me want to go!